You've been gifted with the spark of divinity. Will you give in to the power and leave your mortal life behind? Or will you lead a double life and protect those closest to you? Choose wisely - You only have one soul. Part-Time Gods is a game where players take the role of ordinary people imbued with the powers of a god. Balancing one's mortal and divine lives can be tricky, and divine responsibility doesn't always pay the rent. Powered by the new DGS-Lite system and packed with plenty of character options, players can make any kind of character they can think of and quickly jump into the world. 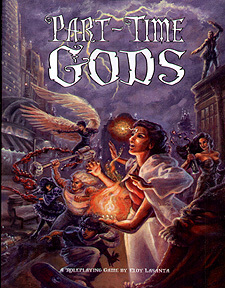 Includes over 40 antagonists, flexible divine magic and an in depth view of the world from the eyes of the gods.